When I mentioned to a friend that I was thinking about growing my own cut flowers this year, she recommended Sarah Raven’s Kitchen & Garden website. So I went online and requested Sarah’s catalogues. I received a very colourful spring catalogue of bulbs, plants, tubers and seedlings, plus a seed catalogue. 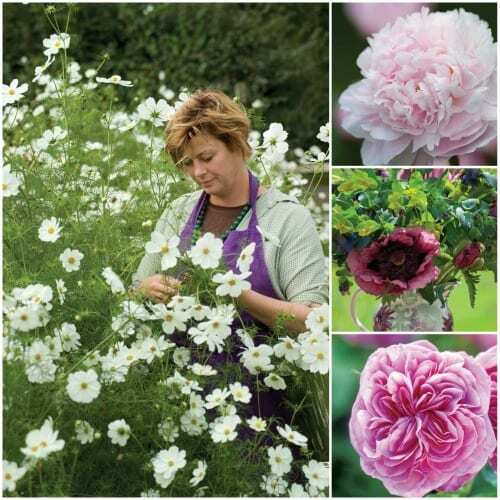 I’ve ordered the Cosmos Collection which includes Cosmos Purity, the tall white flowers in the photo of Sarah above, and deep pink Cosmos Dazzler too. Oh…and I’ve ordered Sarah’s favourite foliage, Euphorbia oblongata. The spring catalogue features stunning photographs by the very talented Jonathan Buckley. And this post features just a few of them. 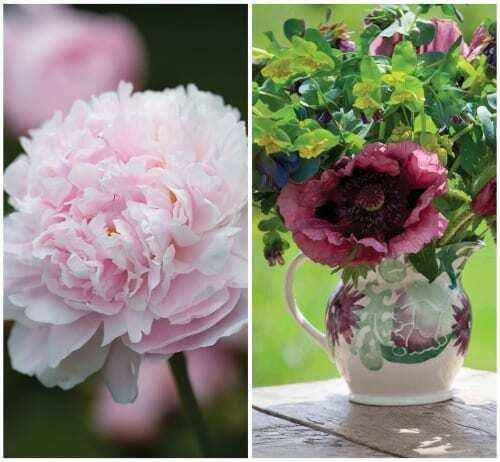 The soft pink fluffy peony on the left is called Sarah Bernhardt, named after a French Victorian actress. On the right is a beautiful oriental poppy called Patty’s Plum. The pink rose on the left below with unusual petals is called Gertrude Jekyll, named after the famous English garden designer. 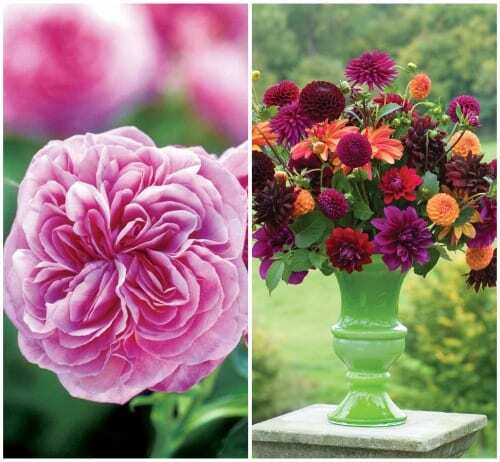 The stunning lime urn on the right is filled with eight different types of dahlia from the Venetian Dahlia Collection. The catalogues also include freesias, gladioli, lilies, agapanthus, echinacea, hollyhocks and scabious, plus many others. If you’re interested in growing your own vegetables, they feature everything from aubergines to chard too. A little bit of background about Sarah…If you live in the UK, you may already be familiar with Sarah’s work. She writes regularly for The Daily Telegraph newspaper and has appeared on the television programme, BBC Gardeners’ World. Sarah is married to author Adam Nicolson, grandson of novelist Vita Sackville-West, who created the gardens at Sissinghurst Castle in Kent. I’ve been told that the White Garden in the summer is spectacular…somewhere I’d definitely like to visit. Sarah and her family split their time between Sissinghurst and their other home, Perch Hill Farm in East Sussex. 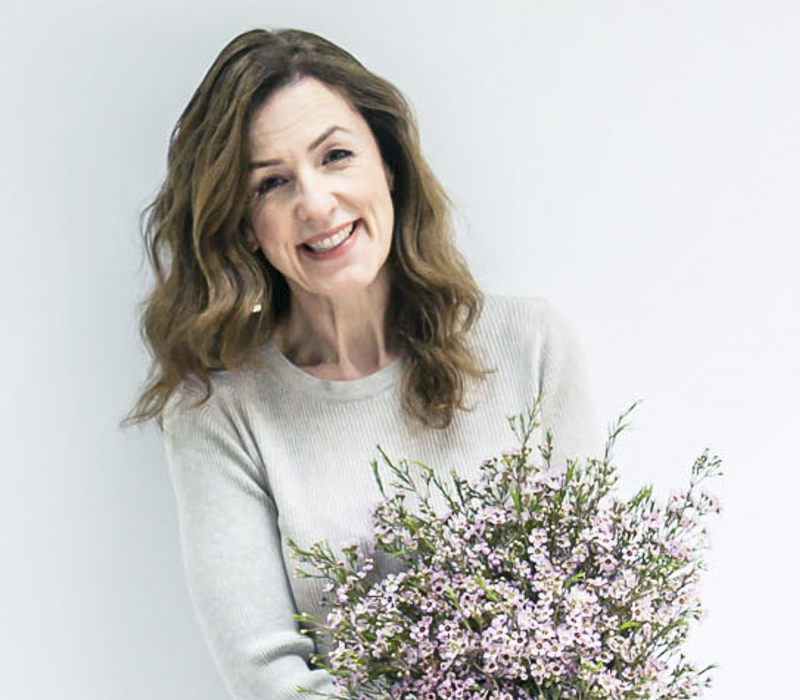 It’s at the farm that she holds her flower arranging courses, two of which are taking place this May : Flower Arranging for Beginners and Wedding and Party Flowers. She’s also written three books about flowers and gardening: Grow Your Own Cut Flowers, The Bold and Brilliant Garden and The Cutting Garden. 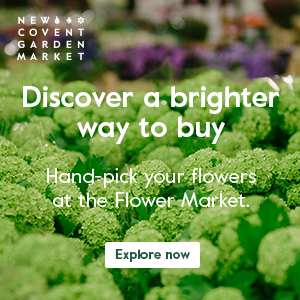 If you’re thinking of growing your own flowers this year, now’s the time to start planning and ordering your seeds, bulbs, tubers and seedlings. So why not take a look at Sarah’s website for inspiration? I’m delighted to let you know that Flowerona readers are entitled to a special 10% discount when ordering online or over the phone before 30th March 2011. Simply quote the discount code, FLOWERONA. Thank you very much to Sian at Sarah Raven’s office for her help in supplying the images. Thank you…they are very unusual. I love the colour combinations! Thank you Lisa :-). I love the floral Valentine’s heart on your blog today!